Probably the most important thing to do before your new baby arrives is to deal with any behaviour problems your hound may have now, rather than trusting to luck and leaving it until the last minute. Get your Beagle used to being confined behind a child gate, so you can separate him easily when you can’t supervise. Teach him to go and settle on his bed for a food treat while you pretend to change a nappy and sort out any lead pulling problems before you start to walk him beside the pram. When you bring the baby home, it can get things off to a smooth start if you can ask Grandma or a friend to carry in the new baby while you greet the dog. He’ll be excited to see you and you risk the baby being scratched if you’re holding him while trying to get through the door. A good idea is to have a food stuffed Kong toy ready to keep him busy while you get yourselves settled in. Few dogs have any problems settling in to their new routine, as long as you make sure they’re still getting enough exercise and you set aside some time each day for ‘dog time’. 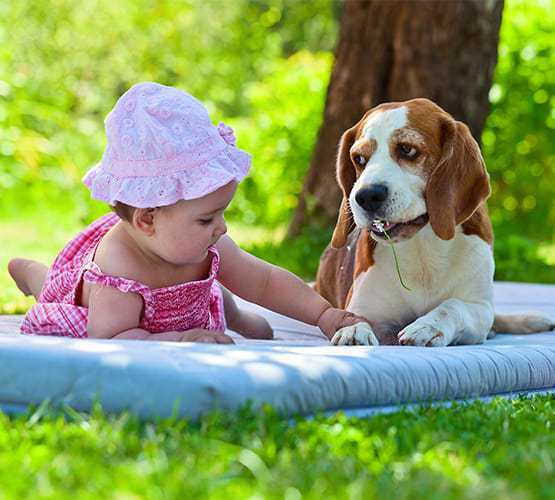 Once the child starts moving around, things can become more fraught and it doesn’t hurt to be reminded that you should never leave a small child alone with a dog, however friendly the dog may have been to a non-mobile child. It’s important that a toddler is prevented from chasing the dog because the dog may be forced to warn the child off by growling or snapping if his exit routes are blocked. Young children are unable to read dogs’ moods and back off themselves, so total supervision is essential. Children can also be bitten by falling on sleeping dogs, poking fingers in the dog’s eyes and ears or by shouting or blowing in dogs’ faces. The best way to prevent accidents is to keep everyone separated by using a child gate. Children learn by copying those around them. Be careful about how you interact with the dog. If you shoo him away from the table by slapping his face and shouting then this is what your child will do if the dog sniffs his toys. Maybe your hound won’t react if you do this – but if your child does the same can you be absolutely sure that the dog won’t challenge him? 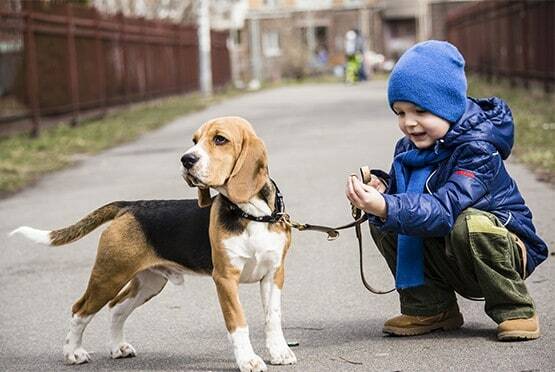 Children and dogs learn best when they’re rewarded for the right behaviour so give treats and praise for the dog for behaving gently with the child and the same for the child behaving gently with the dog. Intervene and separate them calmly if one or the other starts to get silly or over-excited.